FedDev Ontario Funding: Up to $882k for Daisy AI | Mentor Works Ltd.
Daisy Intelligence is a Vaughan, Ontario-based data analytics firm that uses artificial intelligence (AI) to help businesses understand complex problems and make smarter operational decisions. Earlier this year, Daisy was announced as a recipient of the recently launched FedDev Ontario Business Scale-up and Productivity (BSP) program. Daisy will use this repayable funding contribution (government loan) to scale and increase its presence in Canada and the United States. The company will receive up to $882,000 in repayable funding. These funds will directly support Daisy Intelligence to scale and grow into a world-class company. FedDev Ontario’s Business Scale-up and Productivity program is a funding mechanism developed by the Government of Canada and administered by FedDev Ontario, one of Canada’s six regional development agencies (RDAs). The BSP program in southern Ontario is essential to expanding capacity of high-growth companies, building management capacity, encouraging innovation, and developing export markets. Daisy Intelligence has been a Canadian leader in the artificial intelligence (AI) sector since before the term AI had even been developed. Established in 2003 under the name makeplain Corporation, the company was a leader in data analytics development. As advanced technologies redefined the potential of data analytics, the firm rebranded as Daisy Intelligence and has been using that name since 2016. Today in early 2019, Daisy uses artificial intelligence to understand trends in unimaginably large datasets. Their solutions enable organizations to make smarter operational decisions, which in turn boosts client income and streamlines repetitive, relentless, and complex work that would have previously been done by employees – and been subject to human error. Some of their applications include supporting strategic business decisions such as product mix selection in the retail industry and identification of fraudulent claims in the insurance industry. As a company that’s experienced the benefits of other Canadian government funding programs and angel investment, Daisy Intelligence understands that fast growth requires financing through multiple sources beyond internal capital. Receiving funding through FedDev Ontario’s Business Scale-up and Productivity (BSP) program is just the latest way that the firm has intelligently leveraged funding programs to support their growth. Through their successful application to FedDev Ontario’s BSP program, Daisy Intelligence will receive up to $882,000 in repayable funding contributions. Canadian government funding will enable the company to increase its presence in Canada and the United States where it has significant sales potential. In addition, Daisy will create up to 29 new highly-skilled jobs in southern Ontario. These permanent positions are based in science, technology, engineering, and mathematics (STEM) and provide the opportunity for Ontario’s knowledge economy to grow. FedDev Ontario’s Business Scale-up and Productivity program is a repayable incentive that provides funding to companies ahead of large-scale growth projects. By expanding access to capital, it enables firms to invest in business development opportunities, then pay back the funding over a period when the investment is helping to generate new income. BSP’s repayable contributions have a 0% interest rate, so no interest is payable on the loan if the recipient company meets its identified project impacts (such as job creation) and repayment timelines. Companies operating in southern Ontario may receive BSP repayable contributions of up to 35% of eligible project costs to a maximum business loan of $10 million. To qualify for FedDev Ontario’s Business Scale-up and Productivity program, companies must be incorporated, have a minimum of five payroll employees, and have had profitable operations in southern Ontario over the last two years. Businesses meeting these criteria can apply for the program at any time but must receive approval from the program before starting their project to ensure eligibility. FedDev Ontario is one of many organizations that administers government funding programs. Business owners and executives should note that there are many Canadian government funding programs available, each with their own unique eligibility criteria and project expectations. This can be overwhelming, which is why Mentor Works consults businesses on their upcoming strategic projects and recommends suitable funding programs to offset related expenses. Want to learn more about the government funding landscape and discover how your organization can be successful with grants and loans? 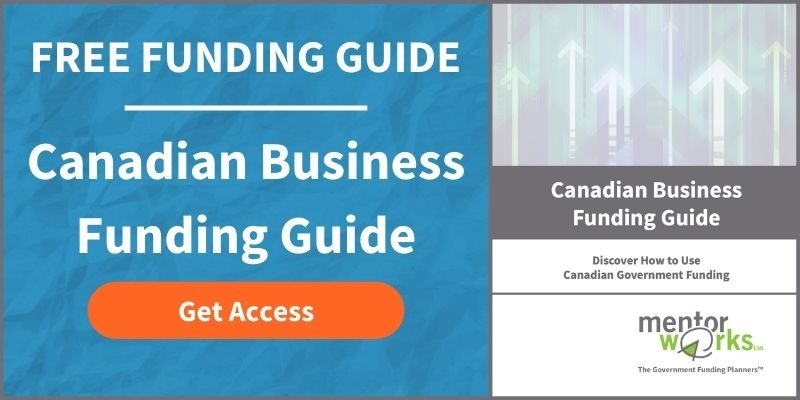 Explore the Canadian Business Funding Guide to kickstart your funding journey.